This research project has been approved by JST (Japan Science and Technology Agency) under the program of “Alliance for Breakthrough between Mathematics and Sciences (ABMS)” in the CREST (Core Research for Evolutional Science and Technology) . Computer graphics (CG) is increasingly transforming every aspect of image creation and processing. 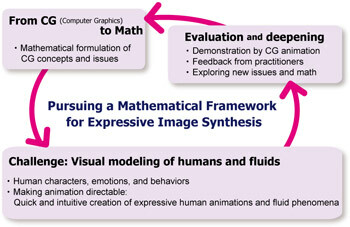 This project pursues a new mathematical framework to greatly enhance the expressive ability of digital image creation. It seeks a methodology for making animations directable in a quicker and more intuitive way than ever before, even while focusing on challenging image categories such as humans and fluids.